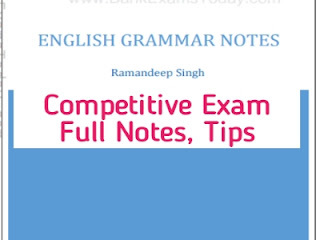 Competitive Exam English Grammar notes provided here. If you are candidates of Competitive Exam, then this book helps to easily learn English Grammar. English is a very important subject for Any kind of Competitive Exam. So you need to some Good Quality Competitive Exam English Grammar notes. Here we update daily English Subject materials, Ebook free for you.